Here at Classic Closets, every closet is unique. Even with production building where every house looks the same, they all are different. Each and every customer has different needs, likes and dislikes. That is where we come in. 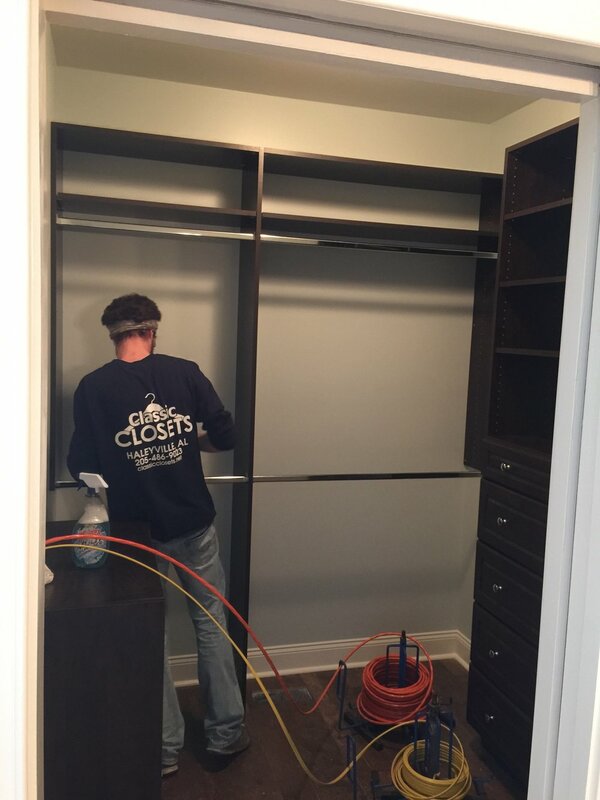 At Classic Closets, we strive to design your closet to meet your exact needs. Today we are going to walk you through our complete process. From setting up your first consultation appointment with our friendly sales staff, to installing your custom closets. It all starts with one phone call. Give us a call or fill out the consultation request form on our website at www.classicclosets.net. You will then be directed to the proper salesman for your area. We currently have 4 salesmen that cover different territories across Alabama, Mississippi, and Tennessee. Pictured here are Barry Tidwell, owner of Classic Closets (see left) and Jim Jones, our North Alabama salesman (see right). What will work best for the space you have? What do you need in your closet? Do you need drawers, long hanging, adjustable shelves, double hanging or shoe shelves? Could you use accessories like a jewelry tray, valet rod, belt rack or tie rack? After you’ve answered all the questions from your salesman and he has measured your space, he will then draw your closet using our state-of-the-art designing software. You will receive a 3D rendering of what your closets could look like. Below are samples of a previous customers floor plan and 3D renderings. If you are satisfied with the drawings, he will then forward them to our main office. When the office receives the drawings and deposit, the plant manager then composes a cut list. He begins the process of breaking down each room so our employees can build shelving one room at a time. Next, the staff begins to operate on the machines. 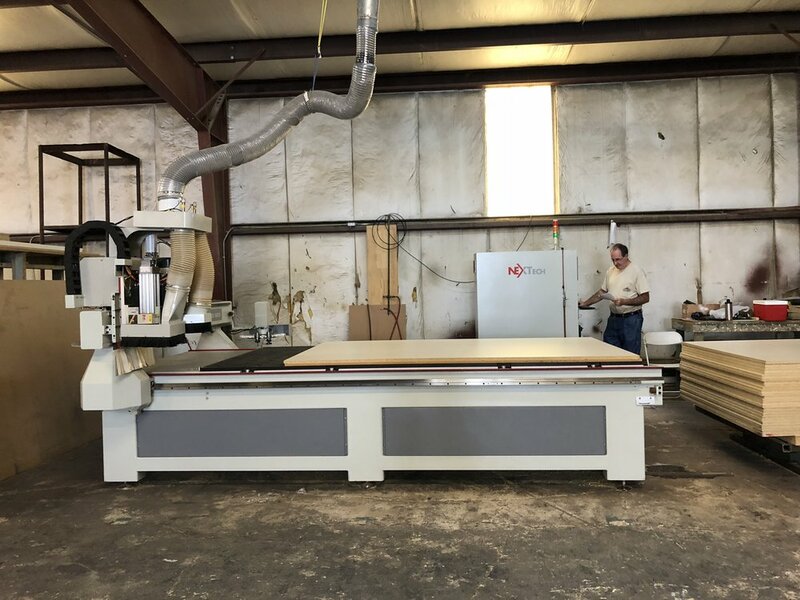 The CNC router can cut down to .005” to ensure complete custom ability for your design. 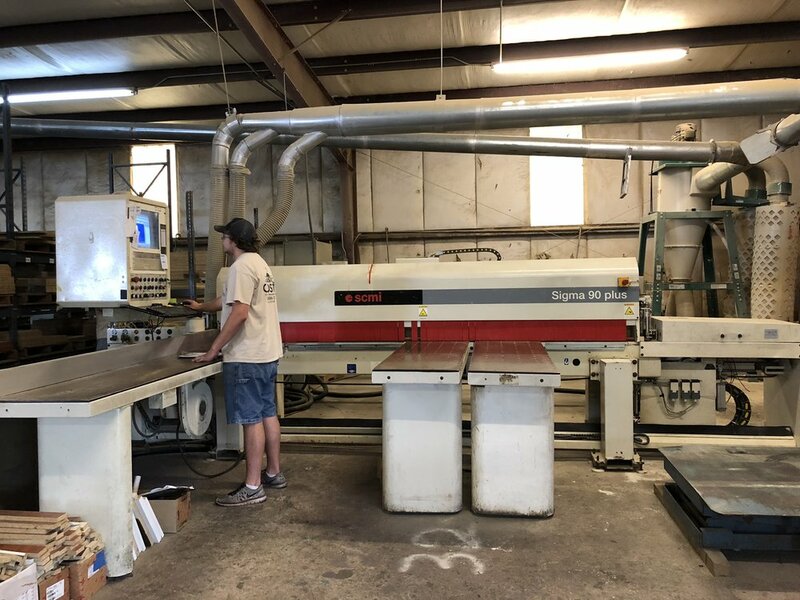 The panel saw then cuts the board to final size. Once all the cutting is finished, the edge bander then puts a smooth edge on all sides of the board. Lastly, the boards are moved to the final station to be wrapped and stacked. To keep all the shelves organized, they are sorted by job, room and unit. They will then be carefully loaded in one of our company vehicles for transportation to your location. Our professional installation crew will meticulously install each organizational unit into your space. You know have a new and improved space to keep you organized! Below are some of our installers hard at work. Call today for your in-home consultation.